For years, the Royal Canadian Mounted Police (RCMP) have used spotting scopes to catch drivers in the act of texting or otherwise being distracted while driving. Now, they’re kicking up their efforts a notch by attaching DSLR cameras to the scopes to better obtain evidence of perpetrators in the act, the CBC reports. 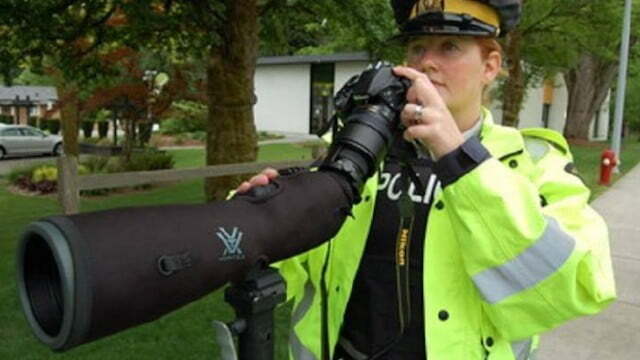 Using a dedicated mounting system, the RCMP is starting to use Nikon DSLRs with a 50mm lens attached to the scope. “When [an officer] sees a violator they can snap a still shot then radio to another officer to pull that vehicle over,” said Constable Melissa Wutke to the CBC’s Calgary Eyeopener program. As for how it’s done, Wutke explains that officers are placed a good distance away – roughly 800-1,200 meters, or half-mile to three-fourths of a mile – from the targeted intersection. When drivers come to a stop at a light or stop sign, officers keep a keen eye through the camera’s viewfinder and prepare to press the shutter when they see a distracted driver and the distracting element in the frame. Once caught, the officer who captured the image can radio to nearby vehicles to pull over the distracted driver. Even if a phone isn’t seen by the officer looking through the scope, he or she can radio to officers near the intersection in the event they suspect someone is driving distracted. Those officers will then approach the car to see if a device is on and nearby.